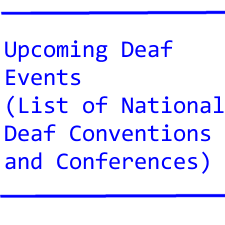 Some one listed the signs that got the deaf into trouble. Should we stop using sign language? No! years, until she gave up and stopped going to practices. Very said and very cruel. dishes. DeafDigest hopes she will succeed. There was an event hosted by deaf children at a deaf school. commissioner but he did nothing. There were no incidents. job application email, but he was very angry about it. job application. Very hard to believe. travels all over the world, making people laugh everywhere. the same – I am Kathy.